The Nexus 6 got stellar reviews, but it’s hard to deny that LG’s 2013 Nexus 5 was the best Nexus smartphone—even Nexus device—ever made. With rumors that LG and Huawei will pitch in to create the next batch of Google phones, the Nexus 5 seemed destined for an update—and this may be it. The leaked image up above comes from MKBHD, the YouTube personality that knows everything there is to know about smartphones. 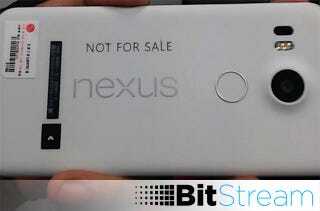 With the incriminating LG sticker and the subtle, matte-finish design, this is most likely LG’s next Nexus. A few interesting tidbits: For one, the Nexus has a bulging camera housing, which hopefully means Google and LG paid a little more attention to the camera this time around. If it’s anything like camera on LG’s latest flagship, the G4, we’ll be pretty happy. An earlier tweet from famous leaker OnLeaks shows LG also with a USB-Type C port, meaning Google will finally make the switch to the superior form of USB.